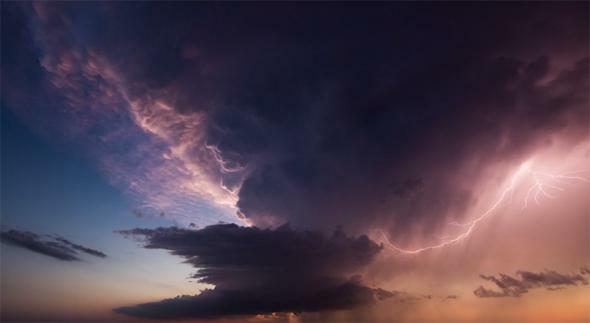 Mike Olbinski time-lapse video of storm clouds. A still frame from the video “Vorticity”, showing lightning in a storm cloud. Mike Olbinksi is a wedding photographer based out of Arizona. He’s also a storm chaser, and creates jaw-dropping time-lapse animations of weather systems that have to be seen to be believed (like “Monsoon II”, and one of a Texas supercell spinning up that looks like it came from a big budget science fiction movie). His latest is called “Vorticity”, and, well, just watch. … and let’s see, what else? Oh yeah: tornadoes. I like how Olbinski timed his footage to the music; it adds a drama to the scenes and forces you to pay attention to certain motions in the clouds. It’s summer here in Colorado right now, and I’ve been seeing all sorts of amazing cloud structures. I have a few pictures I need to post here too… because the science behind them is amazing, but also because of their intense and sometimes almost alien beauty. I think that sometimes science is like a paintbrush and supplies, and the sky is a canvas. Science obeys rules, and creates clouds in certain ways over and again, but there’s so much wiggle room inside those boundaries that no two works of nebular art are ever the same. And they’re always masterpieces.